The Parroquia de San Miguel Arcángel towers over a street in San Miguel de Allende. Photo by @tian.a. My parents used to call me the Sunday School Dropout. Every week, I made a new excuse not to go to mass: I was “feeling sick,” or “too tired,” or “at a sleepover and having too much fun to leave.” Raised Catholic, I knew I should feel sinful for avoiding it, but even as a child,I felt like I was giving away my Sunday mornings to something I wasn’t sure I believed in. I’d heard the same phrases preached again and again: God was my light and I should be excited go to church, to sing praise and secure my place in eternal paradise. But ultimately, the message failed to resonate with me; religion never made me feel anything the way it did for others. I struggled for years to memorize the proper signing of the cross, unable to remember if crossing the chest started from the left or the right. The order seemed so trivial; it created the shape of the cross on my body regardless of where I began. In fact, it all seemed quite trivial to me: the dramatic songs, the early morning service, the sad face of Christ looming over us from every possible angle—the son of the creator, and the creator of Catholic guilt. Religion seemed to me like a performance whose actors were good, but not quite convincing enough; whose storyline, though beautiful and potentially transformative, didn’t truly change the audience for the better afterwards. My jaded attitude didn’t serve me well. Growing up in the South, church was not only a religious activity, but a social one, as well. To have more friends from church than school was common, and youth groups were more like social clubs than holy gatherings. I watched from a distance as my friends went off to Bible study and wondered what I was missing. I failed to understand what otherworldly force could unite people so many people under one roof and cause them to enthusiastically worship something no one could prove was there. The entryway to the Parroquia de San Miguel Arcangel, the neo-Gothic 17th-century church that you can see from practically every angle in San Miguel de Allende. Years later, no longer a child, I found my answer in Mexico, in San Miguel de Allende. The curiosity and desire to understand worship stuck with me for a long time. In a different city and a different day, I wondered if I might find something new, now years and miles away from the place I’d made a first attempt at believing. 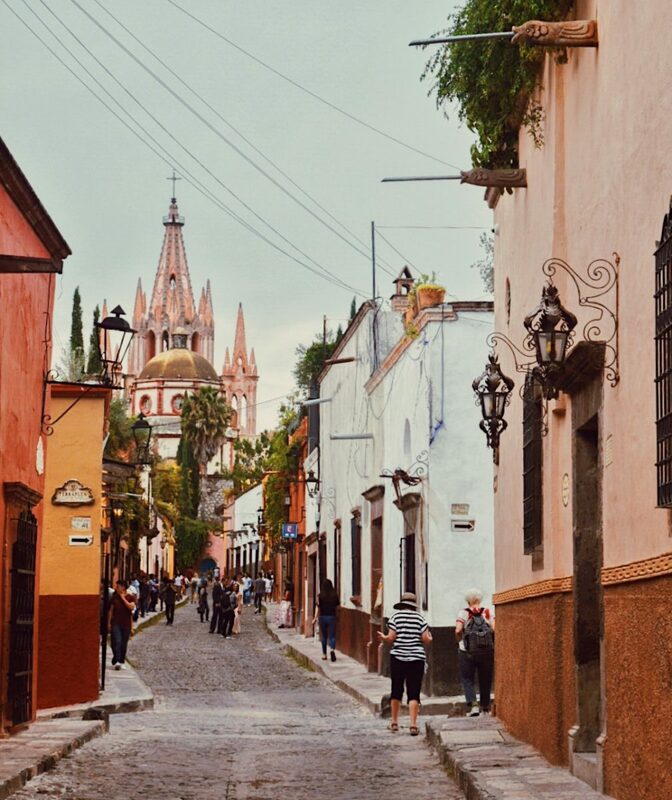 I woke up early and walked through the quiet streets to attend mass at the pink Parroquia de San Miguel Arcángel—half tourist attraction, half place of worship, altogether a sight to see. I felt out of place as I wandered up to the entrance, both a national and religious outsider. I looked around, self-conscious, worried others could sense the Sunday School Dropout sitting in the back of the room. But nobody noticed. In fact, I blended in, because somehow, some things don’t change no matter how far away from home you go. I couldn’t understand every word that was said, but I could feel the rhythm of the church; by the intonation of the priest, I knew when to sit, stand, and sing the long, drawn out “amen” that vibrates through every Catholic gathering, everywhere. Despite the distance from home and the language barrier, I could predict the progression of the service; the familiarity held me steady, and kept me engaged. The beauty of traveling is that the world becomes smaller when you realize that nobody is as foreign as they seem; sometimes, culture shock can come from the things that are the same, rather than the things that are different. 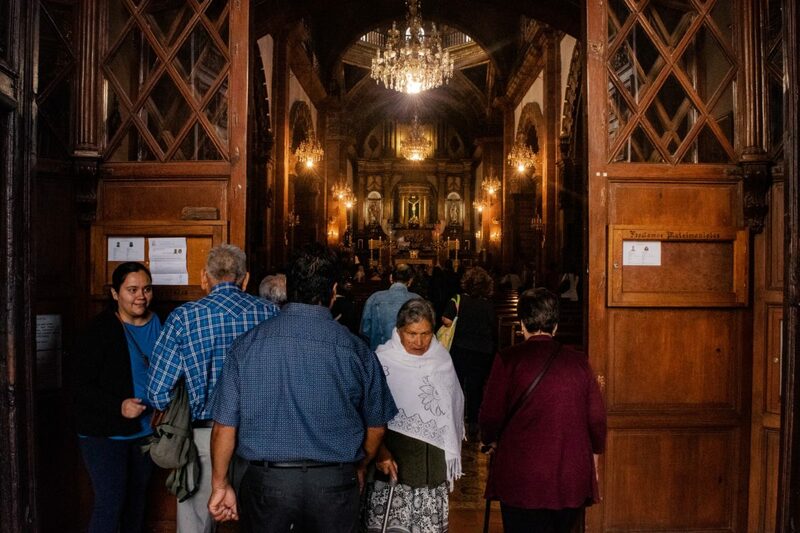 There in the Parroquia, thousands of miles from home, I felt welcome and safe—a sense of belonging amongst strangers who knew the same things as I did. It was then that I understood, at last, what the power of church can be: feeling less alone in a world that can be frightening and confusing on your own. The priest stood at the front of the church, calling out the names of the Holy Trinity: “Padre, Hijo, y Espíritu Santo.” With my right hand, I drew the sign of the cross: forehead, chest, left, right. The order came to me, a muscle memory that carried meaning for the first time.